Playing Disgaea 4: A Promise Revisited reminds me of the times I spent in the late '90s playing Final Fantasy Tactics on my brother's PlayStation. It's hard to imagine enjoying such an in-depth game on a portable system, but it works. There's just one problem though— you're gonna need a bigger battery. If you haven't played the first three Disgaea games, you don't need to worry. The titles are loosely connected in that they all take place in the same universe, but there's no real need to play the previous entries as all the games' stories are self contained. Disgaea has always been known for having a rather colorful cast, but Disagaea 4 boasts the best characters the series has seen. The Tyrant King turned Prinny Instructor Valvatorez is easily the most likable anti-hero in series history. His decidedly more lupine vassal, Fenrich is a welcome counterbalance to his silliness. The dialogue between characters is rarely serious, and breaks the fourth wall whenever possible. Disgaea's trademark sense of humor is alive and well in A Promise Revisited, and that's a great thing. 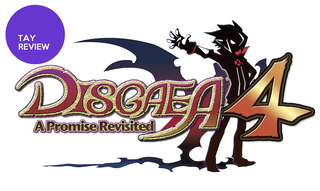 A Promise Revisited is an enhanced port of 2011's PlayStation 3 title Disgaea 4: A Promise Unforgotten. All the content in the PS3 original is present in this Vita port, plus two new episodes and 50 pieces of DLC. Not that the game needed it really. Disgaea 4, like every game in the series before it is packed with a ridiculous amount of replay value. Beating the game's 10 episodes alone will take somewhere in the neighborhood of 30 hours, and that's just the beginning. Disgaea games are all about the grind. After clearing the story, you can continue to level up your characters. How much, you ask? Well, the level cap is 9999. That should give you an idea. If you manage to reach that, you can reincarnate and do it all over again to stack your stats into the millions. And yes, the game features enemies that can still kill you, even after all that work. It's rare to find console games that sport both English and Japanese voice work, it's rarer still to find that in a portable game. I typically tend to stick to Japanese voices, but Disgaea's voice acting is so well done in either language that I ended up sticking with Troy Baker and company's excellent English performance. Early on you'll unlock the cheat shop back at your base in Hades, which serves as the game's hub. The cheat shop allows you to tweak the amount of experience, HL (money) and mana you receive. The further you progress, the higher these values can go, though the only way to free up points to use is to steal them from another type, thus making it feel less like a cheat and more like a gamble. Once you've unlocked your Cam-Pain HQ, you can appoint members of your party to your cabinet. Once you have your cabinet members selected, you'll randomly host other players' foreign ministers to net additional benefits and support when you try to pass bills. The feature feels very spotpass-like and works excellently on the Vita. For the most part, Disgaea 4 made its way to the Vita gracefully. Characters and environments look great on the Vita's smaller screen and the core gameplay successfully made the transition. One thing the Vita doesn't handle so wonderfully, however, is the frame rate. At multiple times throughout the game, especially in the levels with particularly congested maps, the frame rate will drop to the point that even tabulating the score at the end of the level is ridiculously slow. As I mentioned earlier, A Promise Revisited is a console-sized game in a portable package. In most respects, that's a great thing. One place where it's not great however, is when you want to play in short bursts. Often times I would find myself playing when I had just 15 or 20 minutes to spare and I'd have to lock my console mid-fight. That works great if you're near a power outlet and have your charger, but if you're not so fortunate, you'll find yourself having problems. Disgaea 4's Vita showing doesn't allow any type of saving during battle, meaning if that console dies while you're out you'll lose your progress. The omission of this feature feels like a glaring omission for a portable port, and it's a shame it isn't there. A Promise Revisited is a great strategy RPG by any standard, and the fact that it's on a portable console makes it that much more impressive. The frame rate might not be the most solid, and the lack of mid-battle saving hurts, but don't let that scare you off. If you have the time, Disgaea will keep you coming back for as long as you'll let it. Just make sure to keep that charger handy, you'll need it.